How long does a bottle of PureCalm last? Anxiety and Panic Disorders are becoming more and more common in modern life. Although exact figures are hard to come by, it is estimated that up to 6.5% of the population has suffered from a diagnosable Anxiety Disorder, while many more people struggle with uncomfortable and distressing symptoms of stress, anxiety and panic attacks. Motor tension - restless, cannot relax, trembling, shaky, jumpy, facial tics. Autonomic hyperactivity - sweating, cold, heart pounding, clammy hands, dry mouth, dizzy, light headed, hands/feet tingling, upset stomach, diarrhea, frequent urination, shortness of breath. Apprehensive expectation - anxiety, fear, constant worry and anticipation of misfortune to self and others. Vigilance and scanning - distractible, poor concentration, insomnia, irritable, impatient, feeling "on edge" and constantly on the lookout. A phobia is a persistent and irrational fear about something (an object, activity or situation) that results in an overwhelming desire to avoid the feared object, activity or situation. The person usually recognises that the fear is out of proportion, but feels powerless to control it. Mild phobias can be troublesome, but do not usually have a major impact on the person's life. When the phobia or avoidance behaviour is a source of considerable distress or interferes significantly with relationships or functioning, it is classified as a disorder. Phobias are often, but not always, present in Anxiety Disorders. Agoraphobia: fear of being in a public place from which escape or help might be difficult in the case of sudden illness e.g. crowds, public transport, malls, bridges. Social Phobia: fear of social situations in which the person worries that (s)he may be scrutinised by others and be exposed to embarrassment or humiliation. Simple Phobia: Fear of anything else which does not fall into the above categories. e.g. animals, spiders, heights, flying, water, illness, germs, AIDS, etc. In all the above cases, the fear is irrational and out of proportion and affects the individual's functioning to various degrees. For Panic Disorder to be diagnosed, at least three panic attacks must have taken place within a three week period. Some people do, however, experience panic attacks which come and go, usually linked to stress and anxiety. Obsessions are recurring and persistent thoughts, images, ideas or impulses over which the person has little or no control and which cause considerable distress. Compulsions are repetitive and stereotyped behaviours, often intended to produce or prevent some future event or situation. The individual may realise that these actions are senseless, but feel unable to resist them. There is often a build up of tension and extreme anxiety, until the behaviour can no longer be resisted. The individual often feels a temporary sense of relief and a release of tension after it is performed. The obsessions or compulsions are often of such a nature that they are a source of great distress or the individual's social, occupational or relationship functioning is severely impaired. While most anxiety disorders are psychological in origin, or linked to stress, anxiety symptoms may sometimes accompany medical problems like hyperthyroidism, nutritional deficiencies, chemical and hormonal imbalances and other conditions. It is important that a thorough medical examination is carried out to rule out these possibilities. Prescription drugs are too often the the treatment of choice for the vast majority of people suffering from anxiety and panic attacks. Some examples of prescription drugs used to treat anxiety are Diazepam, Alprazolam, Clonazepam, Inderol, Clonidine, Imipramine or Wellbutrin. There are many others. "In my practice, I see many clients who have become addicted to medication prescribed by their doctors for anxiety. Over time they need to take more and more as tolerance to the drugs often develops. When they realize that they are addicted, many people find the withdrawal symptoms so severe that they are unable to stop taking the drugs. Withdrawal symptoms may include depression, severe anxiety, agitation, paranoia, delirium and even seizures. The longer one has been taking the drug, the worse the withdrawal symptoms and many people need medical management to help them through the withdrawal. While this is bad enough, it is my opinion that the use of psychiatric drugs also disempowers people, who then never learn to manage their anxiety in a more natural way.The irony of the matter is that more than 80% of clients who consult me have been able to learn to control their anxiety by means of natural remedies, anxiety management techniques and life style changes - so long as they are committed to the process. Many of my clients have told me that they would never have started taking the psychiatric drugs if they had known how difficult it would be to stop them." - Michele Carelse, Clinical Psychologist. PureCalm, developed with care by our practicing Clinical Psychologist, is 100% natural, safe, and manufactured according to the highest pharmaceutical standards. Individual ingredients are well-researched and have been put to the test over the years as a complement to the treatment of real people with real problems. People are not all the same and treatment for anxiety and panic attacks will vary according to the makeup of the person and the length and severity of the problem. Here is a guideline that will help you to decide which treatment is best for you! 1. Mild to moderate anxiety - general nervousness, restlessness, tension and a tendency to worry a lot. Stressful lifestyle. Take PureCalm drops three times a day for three weeks and thereafter whenever you feel a little anxious. Just a few drops of PureCalm in a little water will help to soothe and calm anxious minds and induce a state of relaxation and well-being. 2. Severe Anxiety, Nervousness, OCD, Panic Attacks and Phobias. May have multiple fears and health worries. Severe anxiety needs some extra help. Take MindSoothe together with PureCalm (see our special combo pack). MindSoothe is a unique combination of St John's Wort and Passiflora in therapeutic dosage. Taken together with PureCalm, it can significantly reduce or even eliminate the incidence and severity of panic attacks and chronic anxiety. Taken regularly, MindSoothe acts as a nervous system tonic and strengthener and will help to decrease nervousness, worry and fear. MindSoothe is an excellent remedy to assist with overall anxiety management and prevention. Regular use results in an increase in self confidence and well-being and a more relaxed state of mind. MindSoothe also has a positive effect on sleep patterns, concentration and memory, which are often affected in anxiety disorders. Our Mindsoothe/Purecalm combination has helped many people who have struggled to control symptoms of anxiety, phobias, panic attacks and OCD. "Frances was a young mother of 26 with two young children under the age of five. She had seen me regularly during her teens when I had treated her for an eating disorder and low self-esteem. As a young adult, she was doing well and she was happily married to a kind and supportive man who was in an executive position and very busy climbing the corporate ladder. Francis came to see me on occasion to seek advice on parenting and often just to 'touch base'. Although she loved them dearly, her two young children often left her feeling drained and she had recently begun working again in a part time position. After many years out of the job market, Francis found that she had lost confidence in herself and she told me that her stomach was in knots every morning and that she was beginning to have panic attacks again - something that she had thought she had left behind in her teens. I advised Francis to try taking a few drops of Becalm in a little water before leaving for work and to repeat the dose if necessary during the day. This she did with very good effect! Before long she had convinced her husband to try Becalm too, to help him with his symptoms of executive stress. I encouraged the family to go for a walk together every evening and to replace their frequent cups of coffee with soothing herbal teas." - Michele Carelse, Clinical Psychologist- Feelgood Counseling. Very Satisfied. I was caught in NYC during the blackout and I have to say I was not anxious or fearful. My motivation is back, my drive and passions are resumed and I'm not on edge. Thank you. Over time, there will be more of us that finally get it as to natural solutions. I am definitely a walking advertisement for Natural Remedies both from the effectiveness of your products and for the warm and timely service you provide." "I began working for a computer company after I graduated and I was soon promoted up the ranks. The higher I got, the more nervous I became until it began to affect my health. My stomach was always in a knot, I had headaches and I couldn't breath properly. When I had to do a presentation, I used to stress for about a week and I could hardly sleep a wink! I'm not really the sort of person to complain but I really couldn't take it anymore. I felt like resigning! Taking Mindsoothe and Becalm has saved my life and I have learned to control my panic attacks at work." Adults: Take 10 – 20 drops in a little water or juice three times daily. If necessary, PureCalm can be taken together with MindSoothe for maximum effectiveness against anxiety, panic and depression. Children: For children 6 years and older - Take 1 drop per age in a little water or juice three times daily. PureCalm can be taken together with Mindsoothe Jr for child depression. Safety during pregnancy and breastfeeding has not yet been established. PureCalm comes in a concentrated tincture formula that facilitates rapid absorption into the blood stream, resulting in almost instant relief, and making PureCalm one the most effective natural anti-anxiety remedies on the market. 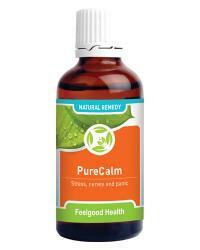 Because of its fast action, you should feel a calming effect within about 5 minutes or less. One bottle of PureCalm (50ml) will last about a month or more, depending on usage. A 90-day supply would be three bottles. 100% Homeopathic remedy to combat social fears and fears of speaking in public! 100% Homeopathic FDA registered remedy to address acute symptoms of fear associated with new environments and challenges! Ease to Sleep! Remedy to gently combat insomnia plus herbal remedy to help you relax! Soothe acid reflux brought on by nerves! Soothing guided imagery audio CD plus stress and anxiety formula! Slowly does it: Strong sexual tonic for men plus anti-anxiety remedy! Helps combat sciatica nerve pain plus anti-stress and anxiety remedy! Unique herbal study aid plus anti-stress and anxiety remedy! Combat Seasonal Affective Disorder plus anti-stress and anxiety remedy! Remedy to assist memory plus anti-stress and anxiety formula!